Yesterday I decided to tackle a hilly route for the first time in what seemed forever. 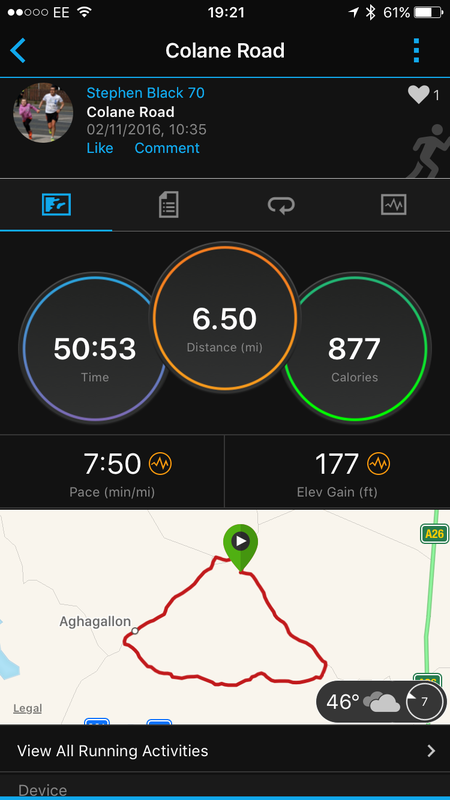 As I have no races on the horizon for the foreseeable future I had been a little demotivated and had been churning out some pretty average times. As my always fragile confidence plummeted further south of ‘average for his age runner’ this materialised itself in a number of ways – one of these was an aversion of tougher, hillier runs. I’ve always had a love/hate relationship with hills. Oh who am I kidding….I’ve always had a hate/hate relationship with hills. I’ve never been good at them and, while I have improved with time, they’ve always been the Achilles heel in my running armour. So it was some trepidation yesterday that I tackled the 6.5 mile Colane Road route that loops round our village. We nicknamed it the ‘Kurt Cobain’ due its suicidal nature (tactless I know) especially a trio of wicked ascents between Miles 2 and 3. But I felt fairly comfortable on all three ascents maintaining a respectable upward pace before powering down the other side. With renewed confidence I picked up the pace over the final mile back down into the village. I was really pleased with my time and, more importantly, how I felt throughout the run. Sore legs yes but a happy heart. Who knows….one day I might be a hill maestro yet. I doubt it but it proves that you should never run away from your fears. Run towards them. Or rather up and over them. Do you love or loathe hills? Tell me about your last run?